The Voltage Tester CA 704 for electricians is a very robust voltage tester. This voltage tester attracts through its convenience. The CA 704 Voltage Tester is waterproof according to IP 65. Besides the measuring functions for d.c. voltage and alternating voltage, this voltage tester is able to measure resistance up to 2 kΩ. The voltage tester is really sturdy up to a height of 2 meters. This characteristic is important for usage of the Voltage Tester CA 704 during the daily routine of building lots. The voltage tester detects phase and neutral wire automatically. Also this voltage tester determines the direction of the rotary field onto display. The adapter CA 751 of the electrical socket can be connected directly with the Voltage Tester CA 704.This makes measuring via sockets much more easier. 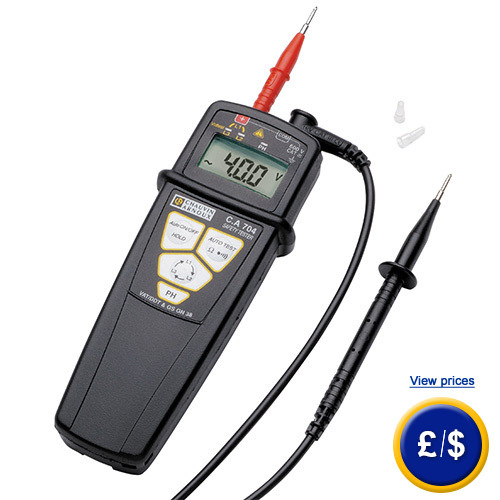 Should you require any assistance in finding the voltage tester you are looking for, do not hesitate to contact us on: UK customers +44(0) 23 809 870 30 / US customers +1-410-387-7703 or have a look at our technical data. Our technicians and engineers will gladly advise you in all multimeters and all products in the field of measuring instruments, regulation and control and scales. 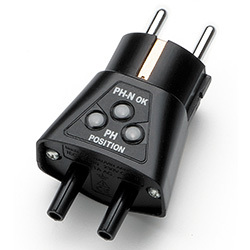 The Electrical Socket Adapter CA 751 has been developed to ensure a fast and simple check of electrical sockets together with the Voltage Tester CA 704. The electrical socket adapter for the voltage tester is also suited for measurements on electrical sockets with child proof lock. The electrical socket adapter will be put on the Voltage Tester CA 704. It is also feasible to use the Electrical Socket Adapter CA 751 with other multimeters The adapter determines phase and neutral wire immediately. Also it will display whether the grounding conductor is installed or not.